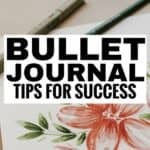 You want to become more organized and have chosen to use a bullet journal. 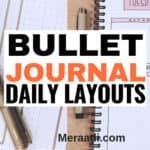 Now you need some awesome bullet monthly spreads to make your journal more functional. Alas, you’ve come to the right place. 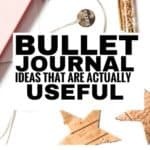 Whether you need simple monthly spread ideas or more elaborate monthly spreads for your bullet journal, you will be able to find them here. 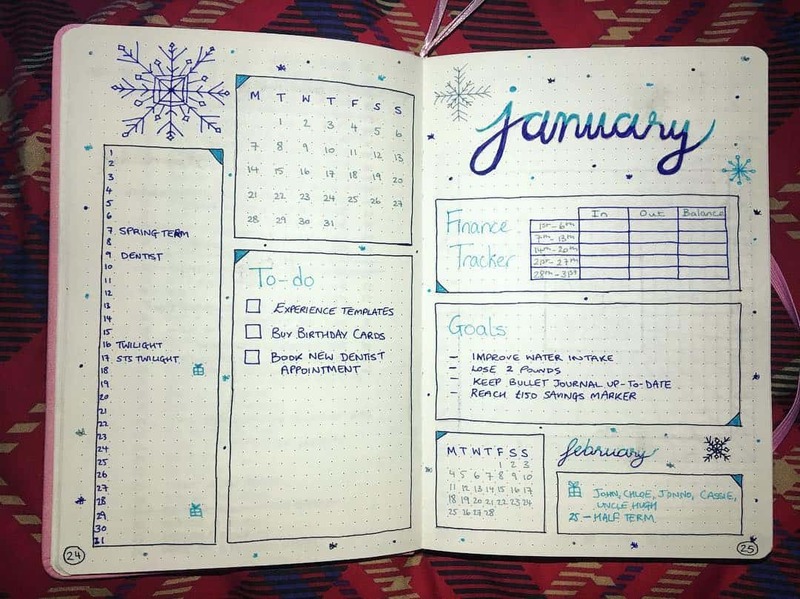 If you need help with coming up with bullet journal monthly layouts that work for your needs, you should be able to find some ideas and inspirations here. 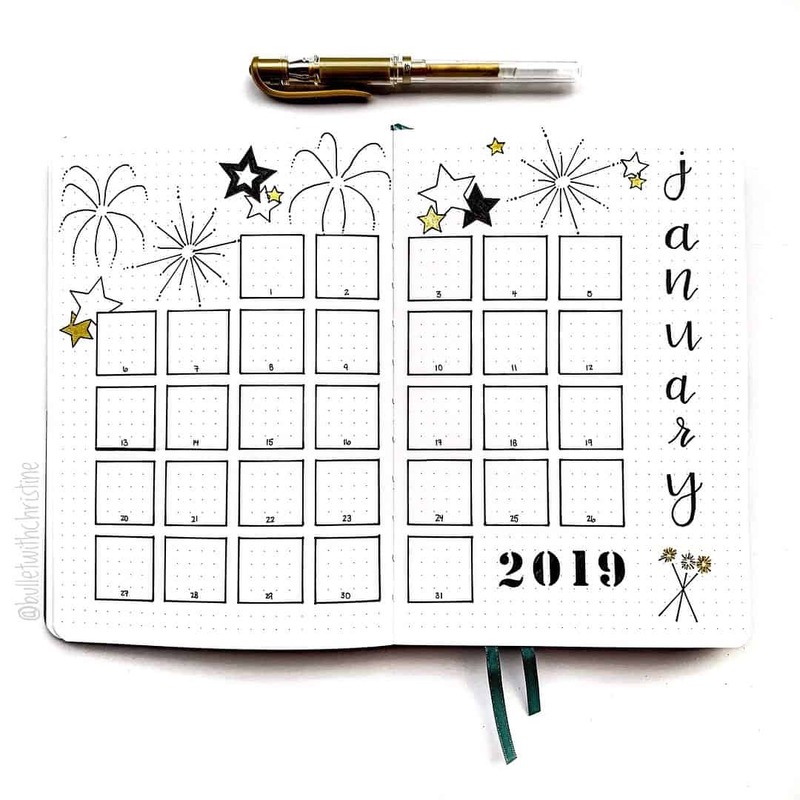 Bullet journal monthly spreads are monthly calendars, where you list all the things you want to get done in that month next to the dates that you want to get them done. You typically create these at the beginning of each month. Great for seeing a full overview of what your month ahead looks like. Monthlies also give you an overview of the highlights of the month, before you get into all the details and tasks for each day. Great if you don’t have a lot going on in your life to warrant needing weekly spreads or daily spreads. They’re great for filling up with upcoming holidays, events, deadlines, vacation plan, doctors appointments and so on. 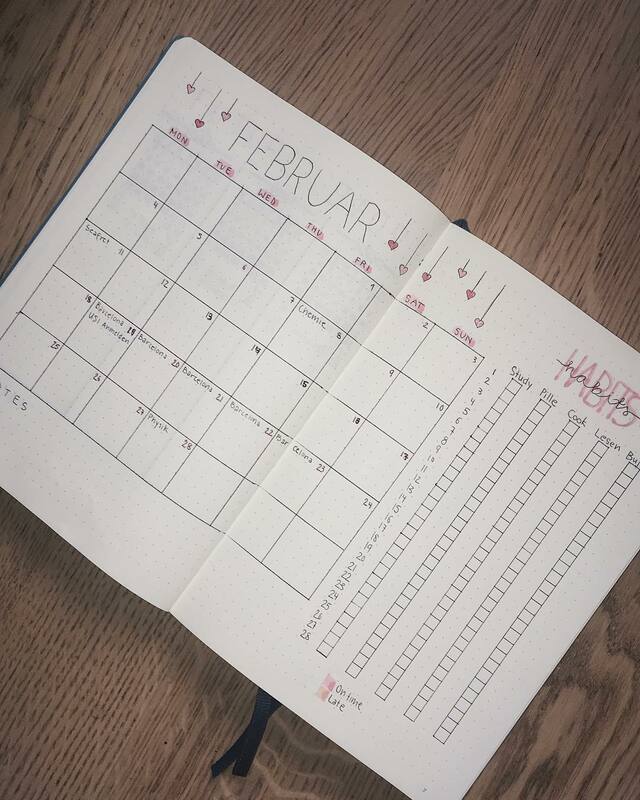 Creating a monthly spread for your bullet journal is a great way to organize your life and be more productive throughout the month. If you know everything that needs to be accomplished, chances are you will find time to get these things taken care of. Like any other planning system, how you fill out your monthly spread is totally up to you. Having said that, these spreads are generally used to get a general overview of your month ahead. Therefore, they usually include things like birthdays, appointments, work schedules and so on. 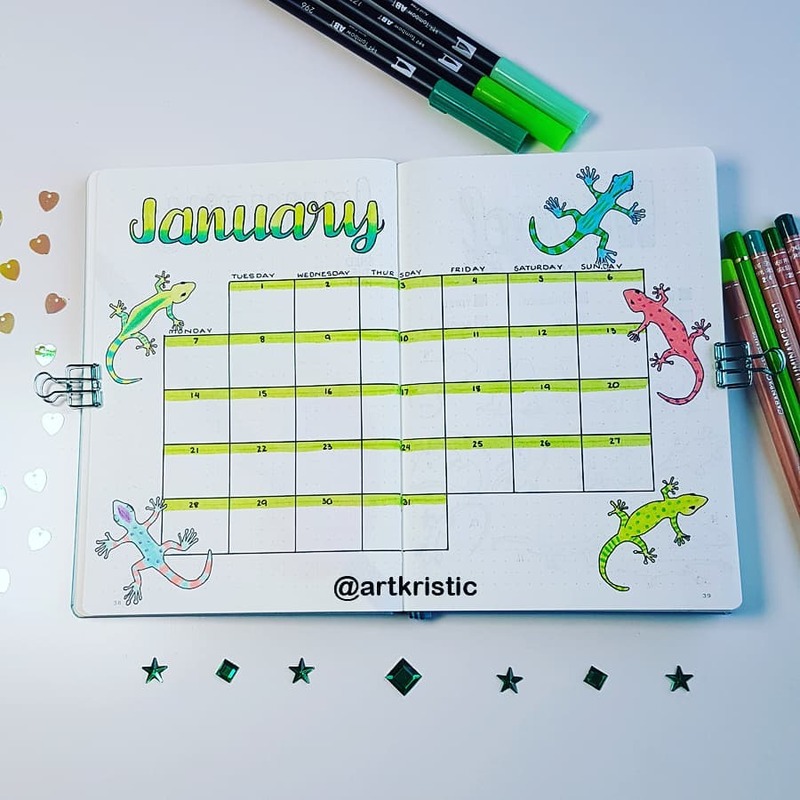 You can also add a few notes to your monthly spreads, monthly goals or your own creative design as you will see in the beautiful bullet journal monthly spreads below. 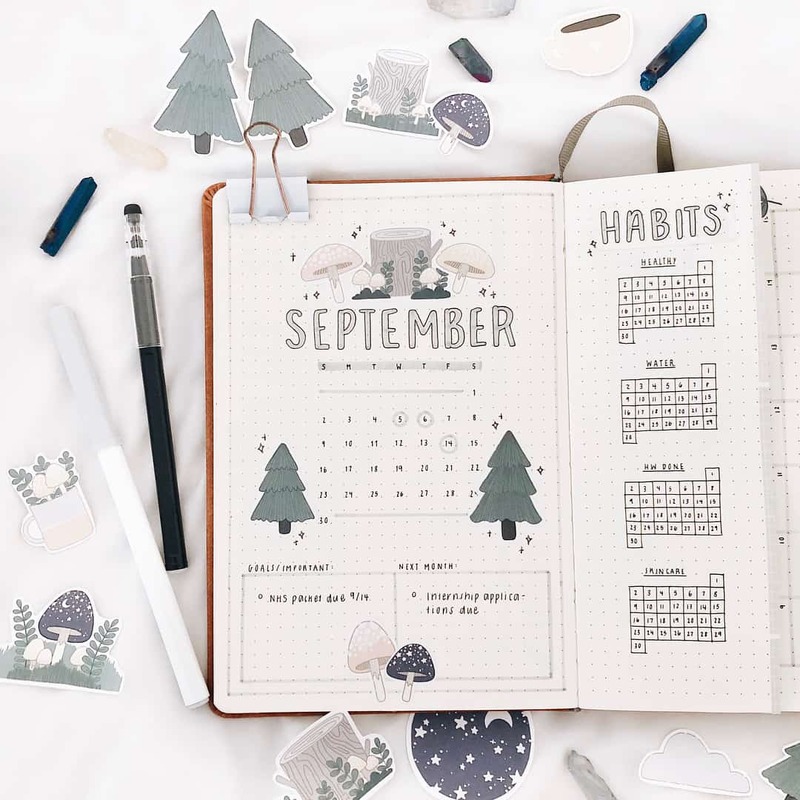 Although these are the most common things included in bullet journal monthly layouts, there are a low of other things people choose to include in their own such as habit trackers, assignments to name a few. Habit trackers are an awesome way to become more productive and build better habits. 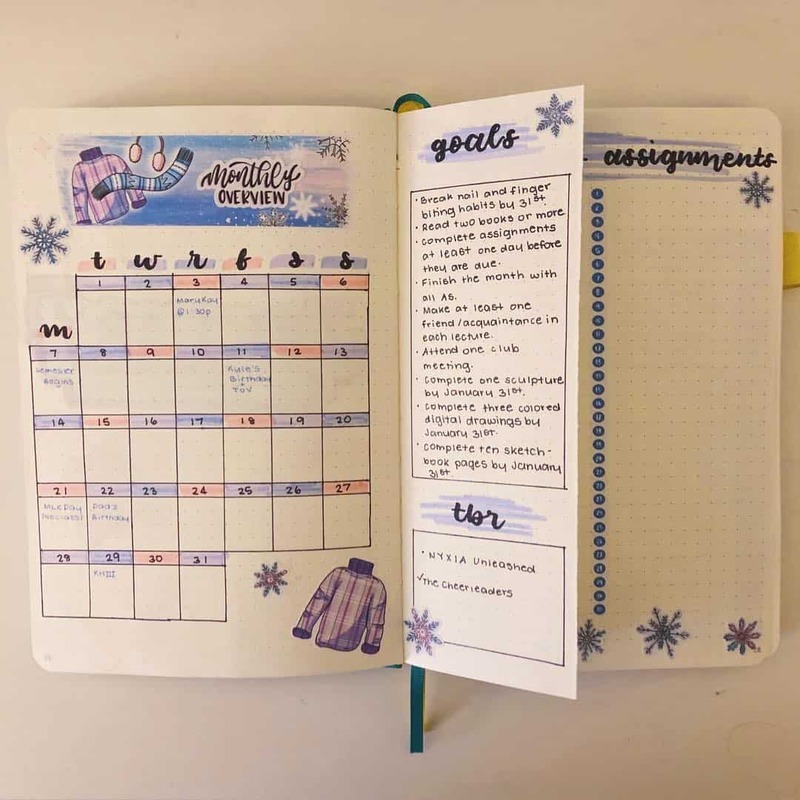 This bullet journal spread includes a beautiful dutch door habit tracker along with a place for goals and future planning. 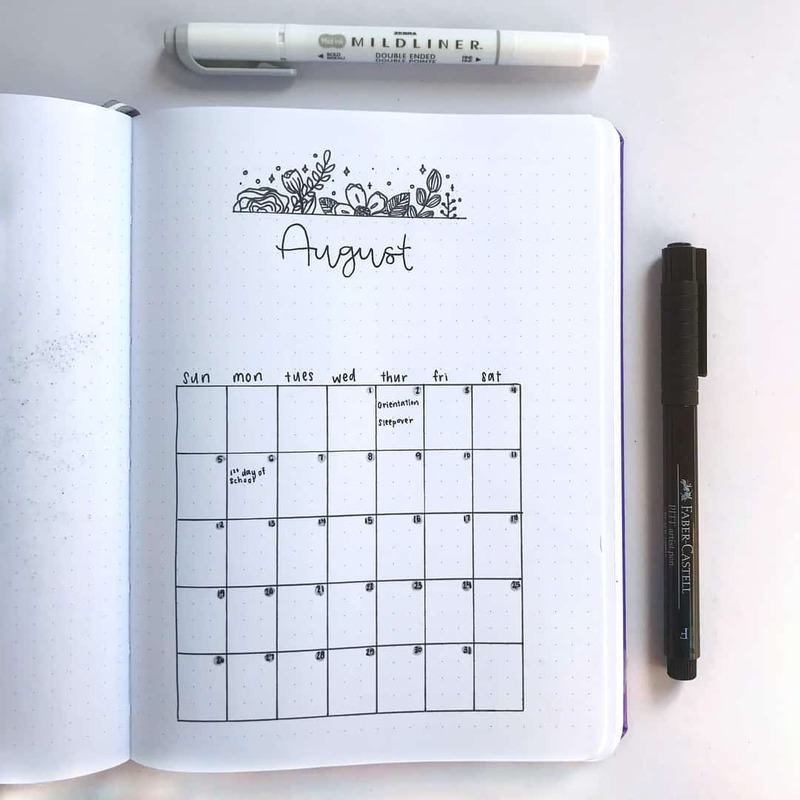 If you like the idea of minimalist bullet journal spreads, this simple monthly spread is exactly what you need. Although this layout has no colors and barely any design elements, it looks amazing! Ready to celebrate the month of love? This brightly colored spread is the perfect inspiration for your February spread. This is another February spread that you can use for inspiration. This one is more minimalist if you don’t like the brightly colored spreads. Do you like elegant looking spreads? If you do, this one will fit quite nicely in your bullet journal. Another great spread you can use to track everything while still adding a touch of art and color. If you like colorful spreads this one is something you can use for ideas. How cute do these lizards look? Sometimes you just want everything tracked on one spread. For those months, a spread like this will be ideal. You can add just about anything that suits your own lifestyle on this spread for an easy overview. One page spreads are awesome, and this one in particular looks. The dutch door goal page is a nice touch too! Planning, in general, is a great thing as it helps prevent things from slipping through the cracks and you’re able to get more done. If you’re considering using the bullet journal planning system, these monthly layouts are worth trying out. 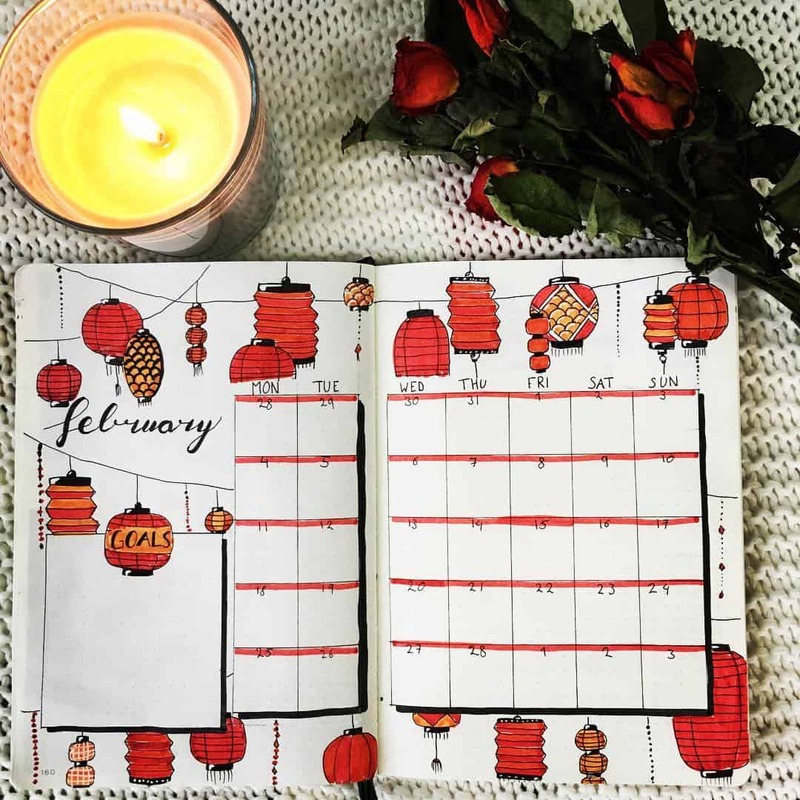 Many people who are busy and have lots of things to get done each month, relay on monthly layouts to help them develop and more organized and systematic approach to the month. Being more organized can help you get so much done every day and this, in turn, will help propel your life forward in a positive direction. 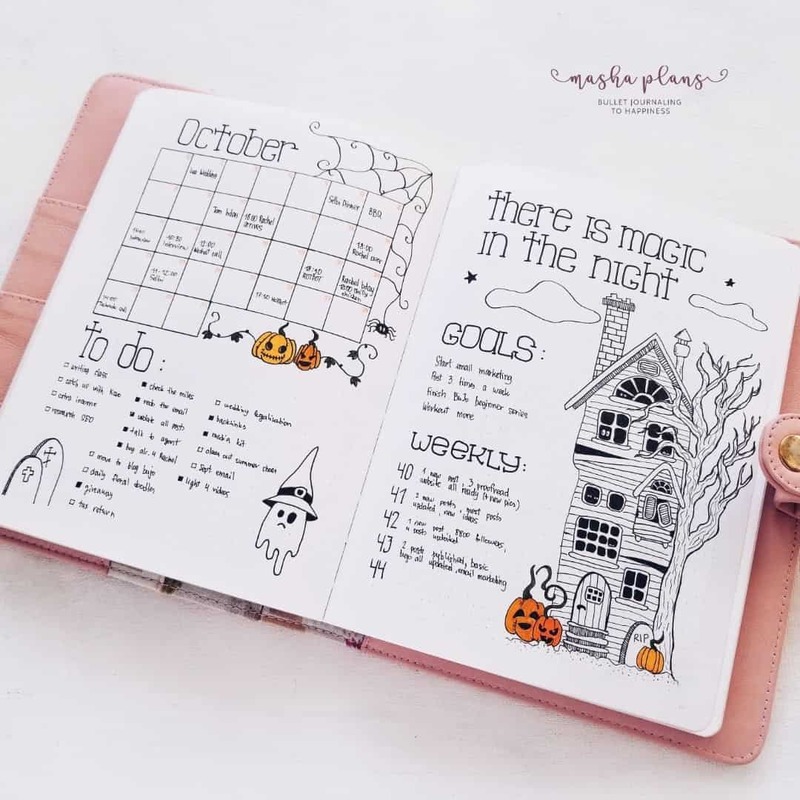 Therefore, use the awesome bullet journal monthly spreads here to inspire you to start using your bullet journal to get all the important things done every month.